I decided to check SonarQube now that it finally supports .NET Core and the new MSBuild SDK format. SonarQube is an open source product from SonarSource. They have a hosted instance called SonarCloud which is free for open source projects! Besides SonarQube, there's also an IDE plugin called SonarLint. I started testing SonarLint out to see if it was even worth setting up SonarCloud. As a test project I picked a tiny OSS library I wrote a few months ago for ASP.NET Core Basic Authentication. SonarLint will run the analysis while using the IDE's Error/Warning panels to notify you when it finds something. Although they support IntelliJ IDEA, the support doesn't include Rider. The support to VSCode doesn't include C# either. Bummer. But honestly there's still no code coverage for CoreCLR yet outside of Windows either. Indeed. I should make that class static. I happen to have ReSharper which is a great (paid) tool by JetBrains. I ran its Inspection/Code issues in Solution and it didn't pick this one up. JetBrains Rider which I use on my work computer (macOS) has the same inspection feature. They do give awesome feedback even though there's no warning for this specific issue. Please note that both are amazing tools. In any case, it's hard to expect that all contributors of an OSS project will have licenses. JetBrains provide licenses to open source project maintainers but not for such small projects like the ones I have. Now that I had a project with a warning, I could test running the analysis scanner on my machine and see what the results look like on the hosted instance SonarCloud. The analysis scanner (although requires Mono, .NET Core and Java) can be executed on macOS and Linux but as today I'm on a Windows 10 box, I followed this guide. The only thing I did differently was that I didn't invoke MSBuild directly, I used the CLI: dotnet build instead. It's really just 3 commands including your build command. I was sad to discover that it requires Java in order to run the MSBuild scanner. I've got a clean Windows 10 install a few months ago and I was very happy not to have Java installed. SonarQube is nice enough to convince me to install it though. Can't wait to see those Java update notifications every week! The analysis took quite a while to run (over 5 minutes). Perhaps because it was the first run, but the report was sent! It was a good quick getting started for me. I'll consider it now for bigger projects too and explore the many features it has. typeof(System.InvalidProgramException): Common Language Runtime detected an invalid program. At first I thought that must be a bug since System.Memory package is still a preview release but it turns out that it's by design. I was experimenting with using ReadOnlySpan<T> instead of byte on Greentube.Serialization. After learning a bit more about Span<T>, mostly thankfully to great documentation from Adam Sitnik I was able to understand what was going on. The problem here is that the compiler will resolve () => sut.Serialize(object)) as Func<ReadOnlySpan<byte>>. That's unfortunately illegal since Span<T> (and ReadOnlySpan<T>) are stack-only types. It can't end up on the heap so it's not allowed to be a generic type. I'm not going to try to explain better than Adam Sitnik so please refer to his doc for more. What the compiler resolves it as now is a simple Action since I'm ignoring the return of the Serialize method which is of type ReadOnlySpan<T>. Now the test passes again. I've also changed the implementation from a null check to a default value check since Span is a value type. Now the exception thrown is ArgumentException instead. The other problem was related to NSubstitute. Having a subtitute of ISerializer is a problem since internally NSubstitute will keep a reference to it which would require boxing the argument of type ReadOnlySpan<T> and that results on the same 'Common Language Runtime detected an invalid program.' error. To solve that, I used a Stub instead of an NSubstitute mock. I recently setup continuous integration for a few open source projects. I used GitHub, AppVeyor, Travis-CI and Codecov. The resulting packages are deployed to NuGet.org. Here I aim to describe the process in an attempt to document it both for myself and hopefully help others in getting started with it. I have some .NET Core projects on GitHub that are actually just .NET Standard libraries. Ultimately, once they are built and tested on Windows, MacOS and Linux, I want them published to NuGet.org. I also want to use GitHub's Release feature to document what I am pushing to NuGet. Some of these projects actually generate more than one NuGet package. That's the case for Greentube.Messaging, Greentube.Serialization and Greentube.Monitoring. Depending on the change I make, I might be looking at publishing any number of those packages. I don't want to publish all packages created while building the repository every time. Travis-CI is used only to build and run tests on MacOS and Linux. AppVeyor, which runs on Windows, builds, run tests while tracking code coverage and sends the results to codecov.io. The result of AppVeyor's build are artifacts, .nupkg files (aka: NuGet packages) ready to be sent to Nuget.org. If AppVeyor is building a tag, it changes the build version to be the value of the tag. That sets the actual version of the NuGet packages created. Also, AppVeyor then creates a GitHub release in draft mode. At that point from AppVeyor I can publish individual packages to NuGet with a button click. The release notes can be added to the GitHub Release and then it can be published. Nearly all settings to AppVeyor, Travis-CI and Codecov are defined on their respective configuration files. Although it's possible to configure all of those via their Web UI, I personally rather use the text configuration file which is version controlled. Previously I mentioned there's no code coverage coming from the Travis-CI build. That’s because as of today there's no way to do it. OpenCover and vstest don't support Linux or MacOS because there's still no released profiling API for those platforms. That seems to be going to change soon though. Firstly note that mono is set to none since I'm building with dotnet here. Since tests run CoreCLR, only .NET Core SDK is required. I'm bulding the specific projects although from the SDK version 2.0.0 forward or so it's possible to build a solution file. That is because all I want here is to run my tests. Running dotnet test will build the dependent projects which in turn will run a dotnet restore if required. Again, this was not possible with .NET Core SDK 1.x. The ulimit -n 512 is there to solve a problem when restoring NuGet packages which open too many connections. Also while trying to solve a problem, I've added osx_image: xcode8.1 to be able to build with .NET Core SDK 2.0. There're tons of other examples on how to get Travis-CI to build a .NET Core project. Here there's more going on. Besides building all commits, including pull requests, AppVeyor will take code coverage and send it to codecov, create GitHub Releases and publish packages to NuGet. The reason for the full PDB configuration is that by default it compiles with portable pdbs and those are still not supported. Code coverage is tracked with OpenCover. I wrote a simple powershell script that will download the necessary tools and, using the .NET Core CLI, it runs all tests while tracking code coverage. Previously I mentioned that nearly all settings are source controlled. That is not true to the API KEY used to send code coverage results to Codecov. That value is defined as an environment variable (named CODECOV_TOKEN) on AppVeyor. The projects being built don't have their version on csproj defined before committing to GitHub. They are always set to 0.0.0 and that gets replaced (aka patched) by AppVeyor before building and packaging it. One thing I've left out of the summary is the creation of a metapackage. That's an attempt to ease into the API adoption by providing the simplest way to get started. Note that obviously the packages referenced by this metapackage are not included in the runtime package store. That means that using this will in fact include the dependent packages in your publish output. Someone wants to try the API? Run a single dotnet add package command and all of the building blocks are available to them. I don't expect it to be used in production though. I advise the fine grained approach instead (pay-for-play). Runing dotnet pack on a project that has no code yields no package! The CLI will not build up an empty package. To create a metapackage you need to use a nuspec file. To pack this one up, there's a line in the configuration invoking nuget pack instead. I've added to .appveyor.yml (see below) a piece of powershell which resets the version of the build to the tag if that's what's being built. Pushing a tag is the method to express the intent of a creating release. 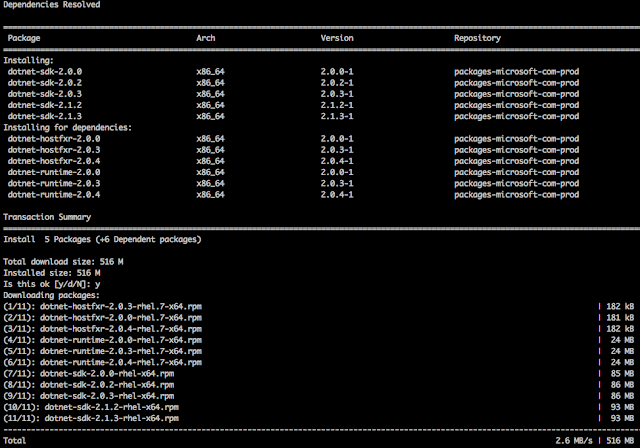 I'm using semver and NuGet already takes packages versioned N.N.N-something as a pre-release package. That means a tag 1.0.0-beta will publish a pre-release package. On the other hand, if the tag is simply 1.0.0, that'd be a plain release. AppVeyor will push every artifact of that build to GitHub's drafted release. Considering that I do not always publish all packages to NuGet, I remove whatever package I didn't publish to NuGet before finalizing the GitHub release. Publish desired packages to NuGet through AppVeyor UI (more below). Publishing to NuGet is not done automatically as a result of the release creation mentioned above. The reason is that each build results in multiple packages as artifacts and publishing is a all or nothing approach. I'm looking for publishing packages in a selective way. AppVeyor has environments which can be configured to deploy specific artifacts from specific projects. Those can also be defined via the configuration file but you'd still need to define which 'environment' (aka: package) you want to deploy anyway. At that point I've chosen to use AppVeyor's UI to set-up these environments. To get something deployed I can click a single button which pushes that single package to NuGet.org. I'm still trying to push the markdown docs automatically together to NuGet. I've asked about it on StackOverflow a few days ago but still not answer. One downside of this approach is that the dependencies between the packages have to be tracked by yourself. If I want to publish Greentube.Messaging.DependencyInjection.Redis, I need to take into consideration that it depends on Greentube.Messaging.DependencyInjection which in turn depends on Greentube.Messaging of the same version. For that reason, the 3 packages have to deployed otherwise restoring the first one will fail. # If there's a tag, use that as the version. Everything about .NET Core changes rapidly. The tooling around it specially. A lot of configuration I've come up with was added as a reaction to some issue I encountered. I'm sure many of these issues will be solved soon so configuration could be simplified. An example is the full pdbs for coverage and the profiling API on MacOS. Take that into account when getting your own setup ready.